Rebekah Carey McNall is completing an internship in France at our sister store, The Bohemians. While there, she is scouting french treasures to bring back for Mignonne ... as well as completing window designs, interior merchandising schemes and general sightseeing and vagabondry! We're stealing some shots to whet your appetite for all of the sweet things to come in July. 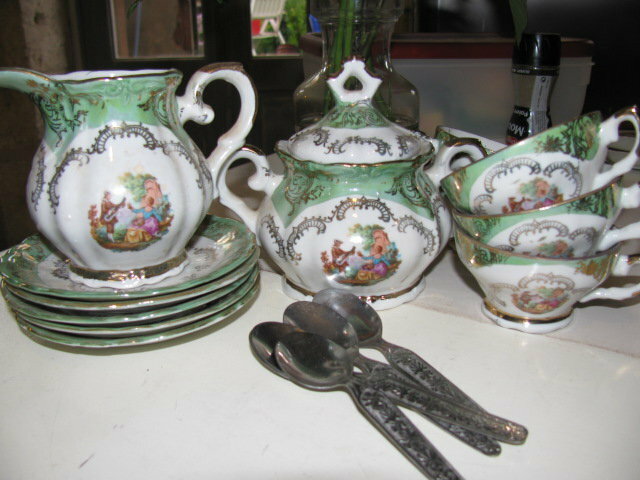 Here is an adorable porcelain coffee or tea set from Limoges ... 4 cups, saucers, sugar and creamer and tiny spoons ... depicted are a courtier romancing a young miss with his mandolin ... a charming country scene. Delicious and soon to be seen in our Berkeley shop! tra la la ... ooh la la !